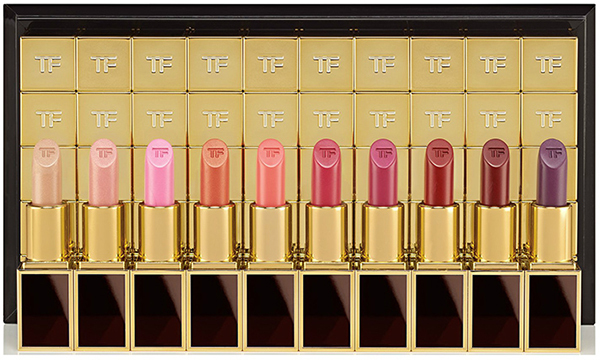 Tom Ford Beauty Lips & Boys Lip Color Collection For Holiday 2015 | Top Beauty Blog in the Philippines covering Makeup Reviews, Swatches, Skincare and More! The limited-edition collection of all 50 Lips & Boys, a first of its kind collection of lip colors named after men Mr. Ford admires from intimates to collaborators to men he finds inspiring. Each lip color is showcased in sleek, clutch-sized packaging. This decadent wardrobe of rich, specially treated pigments are blended to deliver pure color with just the right balance of luminosity. Presented in an exclusive, black lacquered tom ford case. THIS SET CONTAINS: Holden, Beau, Collin, Cary, Guillermo, Ian, Flynn, Addison, James, Richard, Julian, Pablo, Xavier, Stavros, Liam, Henry, Alejandro, Luciano, Leonardo, Wes, Patrick, Michael, Justin, Giacomo, Rafael, Ansel, Alex, Rocco, Austin, Kingston, Louis, Jude, Malik, Daniel, Drake, David, Demsey, Jake, Hiro, Eric, Vladimir, Roman, Egon, Eddie, Derek, Roberto, Tony, Joaquin, Theo, Jay.